« AZ IBA Team Ventures Into the San Rafael Valley! 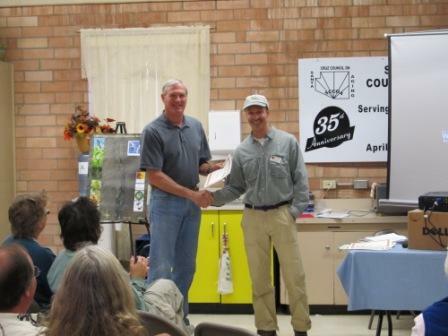 Upper Santa Cruz River IBA Recognition Ceremony a Success! On the morning of Saturday April 16, a group of enthusiastic folks gathered in Tubac to celebrate the Upper Santa Cruz River IBA. The morning began with two bird walks which turned up many classic riparian species such as Wilson’s Warbler, Summer Tanager, Northern Beardless-tyrannulet, Bell’s Vireo, Barn Swallows, Lazuli Bunting and Gray Hawk. Some surprise birds also made an appearance including Pine Siskin, Bullock’s Oriole and Bridled Titmouse! It was fun to see so many species in such beautiful riparian habitat. It really showed us what Important Bird Areas are all about! Soon it was time for the actual recognition ceremony to begin. The attendees gathered in the community center and settled in for several presentations. Scott Wilbor, AZ IBA Conservation Biologist, kicked everything off with a brief welcome and run down of the morning would entail. Paul Green, Executive Director of Tucson Audubon Society, then spoke about how birding enriches a community and its economy. Then Scott talked about the IBA program itself, the Upper Santa Cruz River IBA and its importance to the birds that live there. Then Scott presented several certificates of appreciation to individuals and organizations that helped make this area an identified and now recognized Important Bird Area. Those recognized included volunteer IBA bird surveyors, the Tucson Audubon Society restoration crew, Friends of the Santa Cruz River, The Sonoran Institute, community leaders such as Amy McCoy, Richard Bohman and Sherry Sass. The ceremony then wrapped up with a reading by Ken Lamberton from his book: Dry River Stories of Life, Death, and Redemption on the Santa Cruz. It was a moving and appropriate ending to the ceremony. It was then time for some refreshments! The attendees then moved outdoors and enjoyed some delicious brunch foods from Tubac Market, mingled and chatted, looked at the beautiful poster of the birds found in on the lower Santa Cruz River and a large map of the boundary of the IBA. The event wrapped up just as the temperatures began to rise. But the excitement was not over! As the Tucson Audubon crew and volunteers were putting away everything from the event, we had some exciting avian visitors. First a Zone-tailed Hawk made an appearance overhead giving everyone great views. Then a pair of Grey Hawks circled very low over the building a few times and then headed over to the riparian area much to the delight of everyone on the ground. What a perfect end to the day! This was a fun event made possible by the hard work of Tucson Audubon Society staff and volunteers and made successful by the enthusiastic attendees who took time out of their busy lives to be a part of this event! Thank you!